This Arrabbiata, or spicy marinara, combines tomatoes, red chili, garlic, and olive oil for a delicious sauce with a kick. 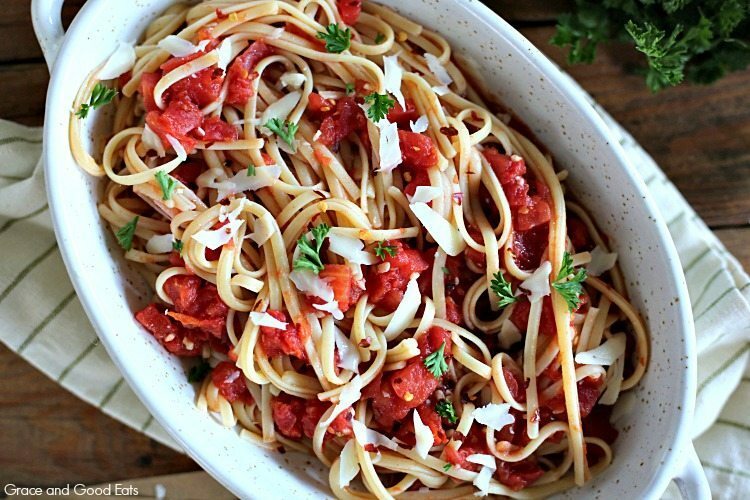 Serve this simple Linguine Arrabbiata with a loaf of crusty French bread and extra olive oil for dipping! This is a sponsored post written by me on behalf of Skinner® pasta. On Sunday nights our family meets up with a few friends from our church for Journey Group. Journey Group is a small group of people who commit to invest in each other and gather weekly to pursue friendship, Bible study, prayer, accountability, and encouragement. We’ve had shredded BBQ sandwiches, homemade chili, and grilled burgers and hot dogs. Homemade chocolate chip cookies and the yummiest bite-sized pumpkin cupcakes with cream cheese frosting. 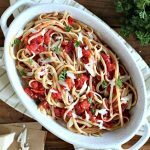 The rotation made its way back to me last week and I decided to make this simple Linguine Arrabbiata for everyone. 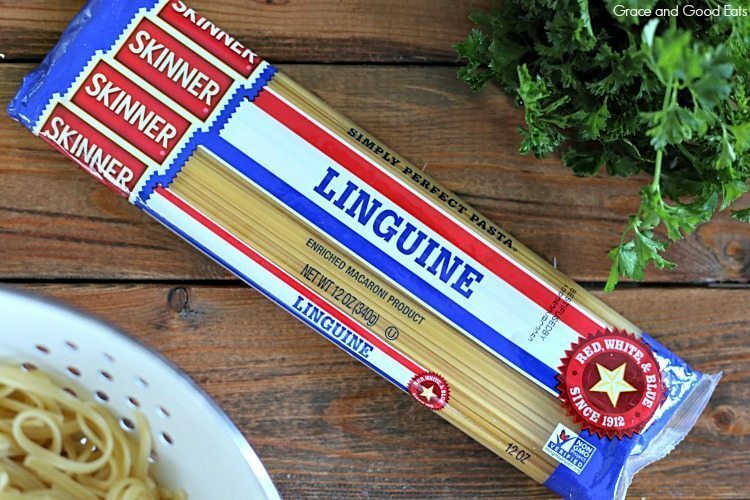 I chose Skinner Pasta because it is friendly on my wallet, which always comes in handy when cooking for a crowd. It’s also great tasting, easy to cook with, and always turns out right. You may not know this but Skinner Pasta, based in Houston, is the #1 Pasta in Texas. Many of the employees at Skinner were recently affected by the flooding and destruction caused by Hurricane Harvey. Like many Houstonians, Skinner stepped up to help, donating 37,000 servings of pasta and rice to the Houston Food Bank. They also set up a food truck, traveling to areas of the city devastated by the flood and offering free hot meals to those who needed it most. Teams of firefighters and paramedics from James’ fire department were sent to Houston to help and I know hot meals were extremely appreciated. I loved hearing how Skinner stepped up for their friends and neighbors in my home state and couldn’t think of a better recipe, or brand, to use when preparing a meal for the people that I am doing life with. 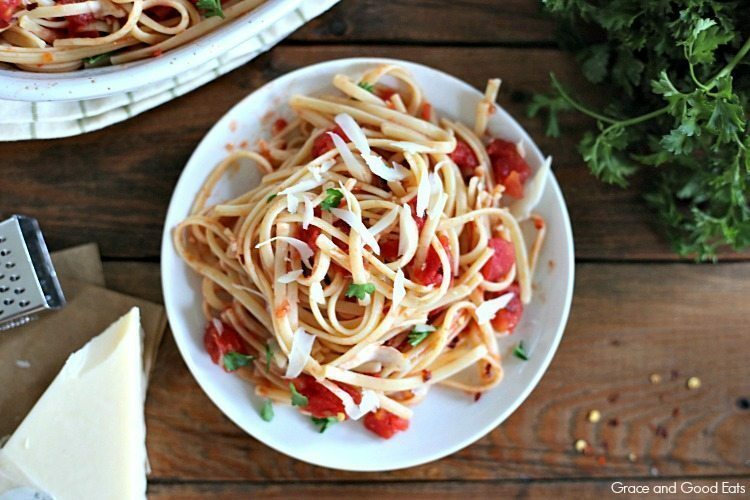 This Linguine Arrabbiata is so simple to throw together and can be as spicy as you prefer. Go easy on the red pepper if you like a little less heat, or use a heavy handed pour if you like it hot! This Arrabbiata, or spicy marinara, combines tomatoes, red chili, garlic, and olive oil for a delicious sauce with a kick. 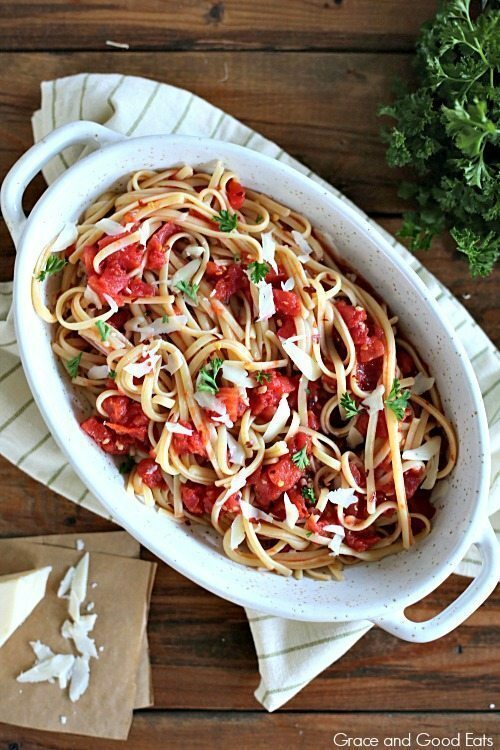 Serve this simple linguine arrabbiata with a loaf of crusty French bread and extra olive oil for dipping! Fill a large saucepan with about 6 cups of water. Season with 1 tsp salt and bring to a boil over high heat. Add the linguine to the boiling water and cook until tender as directed on the package. Peel and roughly chop shallot. Peel and mince garlic. Pick and roughly chop parsley. Add olive oil, crushed red pepper, shallot, and garlic to a saucepan over medium-low heat. Cook 4-5 minutes while stirring continuously to prevent the garlic from browning or burning. Add the tomatoes with juice and a pinch of salt and pepper. Turn heat to high and bring sauce to a simmer. Reduce heat to medium-low and cook 10-12 minutes. Add the drained pasta to the sauce. Cook an additional 2-3 minutes. Remove from heat and top with shaved pecorino Romano and parsley.